Hello and welcome to Day 3 of our April Rubber & Die Release Showcase! On Wednesday (18 April) Whimsy Stamps released this month’s new rubber designs and new Shapeology dies. From then until 24 April the Whimsy Stamps DT and Special Guests are showcasing these fabulous new goodies with a daily mini blog hop and I am part of today’s hop! To be entered into today’s mini blog hop prize draw, be sure to leave a comment on ALL of the DT’s posts listed below by 12.00PM EST tomorrow. All winners will be announced on the Whimsy blog on 25 April. 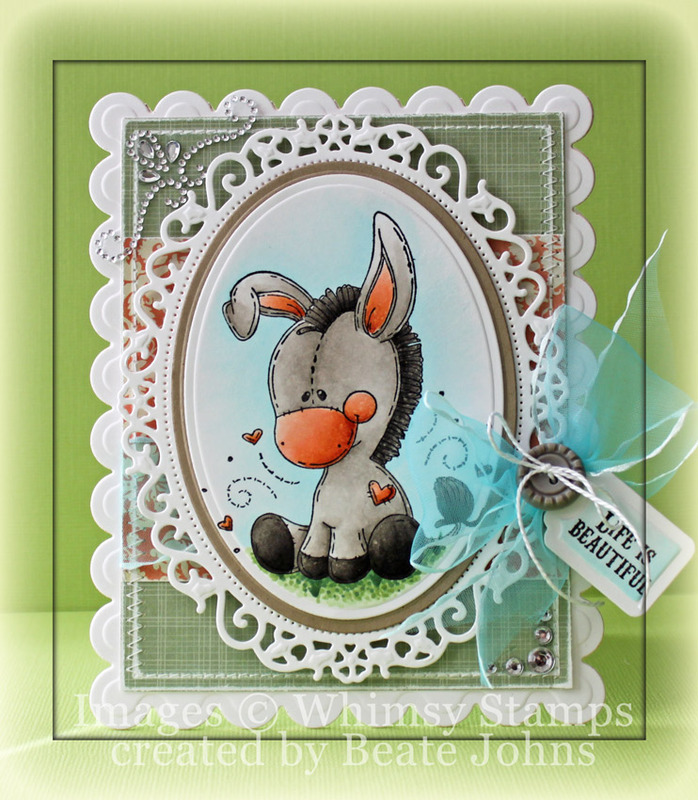 My card today features the darling Sweet Little Donkey from Meljen’s Design. I love that image. I already had it as a digital image, but I love it so much, I had to get it as a rubber stamp as well. The image was stamped in Tuxedo Black Memento Ink on Neenah Solar White cardstock, cut and embossed with a Petite Oval Nestabilities die and colored with Copic Markers (donkey: W0, W1, W3, W5, W7, W9 Nose/ear: R01, E93, E95, E07 Grass: G40, G43, G46 Background: BG0000, BG000). The image was first layered on a piece of Kraft cardstock, cut with a Petite Oval Nestabilities die, then on white cardstock, cut and embossed with the largest Floral Oval Nestabilities die. Two pieces of Pink Paislee Nantucket Patterned paper were cut and embossed with a Grand Rectangle Nestabilities die. The edges were sanded, stitched and May Arts ribbon was tied around the horizontal strip. The paper was adhered to the card base, white cardstock, cut and embossed with a Grand Scallop Rectangle die. The image layers were adhered to the card base with dimensional adhesive. Fancy That! Border Bling was added to the upper left hand side of the card, Silver Rhinestones to the lower right corner. A sentiment from Good Life Tickets was stamped in Tuxedo Black ink on a piece of white cardstock, cut and embossed with a tag die from Home Sweet Home . The embossed part was colored with Copic Marker BG0000. It was tied to the bow with a button and embroidery thread to finish off the card. Remember that the entire new release is available to buy right now from the Whimsy Stamps store along with all your Whimsy favorites. Oh GOSH; I love this image and you have made him into a beautiful card! Loving the border you have put him in and that big bow is just FAB! 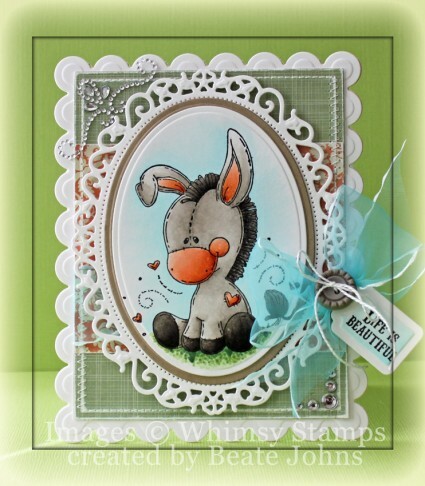 Oh I love this Donkey by Meljens Designs!!! It is soooooo darn Adorable!!! I love your card with it too! Gorgeous!!! Awww, so cute! And your card is so gorgeous Beate, as always beautifully colored! Beate, sooooo cute! Love this image too! You have coloured it so beautifully! this is absolutely awesome! love the combination of shapes! wow what an adorable card. So beautiful. your little donkey looks 3 dimensional… beautiful coloring. Super sweet card. I love how you did the grass and sky. Awww what an adorable card!! Your coloring is just gorgeous!! I just love your cards – the donkey is too cute! Oooooo this little donkey is so cute =) Really adorale card! Wieder eine wunderschöne Karte. Das Motiv ist so niedlich und ich bin immer hin und weg , wie du die Spellbinders auf deinen Karten verwendest. Toll! What a cute monkey. I love your card, great nestablilitie. Fantastic card, Beate! I love the sweet image and you’ve colored and framed it so perfectly! Wonderful details and design! Awwww,so wonderfully cute!!! Loving the die cuts and great sewing!! This is soo cute. I love the image and the dies you used. TFS. Oh Beate this so cut and gorgeous! I love this little guy! Cute card! Wishing you a happy day and a great weekend! So adorable Beate – love what you’ve done with this cutie! Super little card. The image is so sweet and adorable. Your card is so adorable – the colouring is so expert – wish mine was the same! 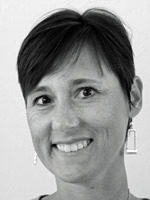 Beate you are a magnificent artist! Each and every one of your designs is fabulous! I love your donkey card and those nesties are awesome. I may be making a purchase. lol. Very cute–great coloring and I like the dies you used. So cute!!! Love the layout. This little donkey is so cute. Love the frame too. Gorgeous card Beate! I love the design and pretty details! What an absolute sweetie. I love the card you made with this delightful stamp Beate. What fun little guy! your coloring is fabulous as usual. Love it! This is just so cute. Lovely card with such beautiful colouring. Awh Beate! This little donkey is just soooo cute..You have coloured him so beautifully. Love the frame you have used and all the lovely bling…stunning! I know I have said this over and over, but wonderful coloring and such a cute image to work with! I love what you did with MR donkey! Great work! what an adorable donkey. kinda makes me think of Eore although he was a down in the dumps type. all the layers on your card with spellbinders are terrific! Oh that donkey is so sweet!! I see why you love him!!! Love the fancy bling and must pick them up today at my LSS if I can! Cute as a button—great colors….like how you added the bling…and wonderful sentiment!!!! Cute image! I like the colors you used to color it! doesn’t this little donkey look so pretty all dressed up?! 🙂 what a great card! I have always loved this little guy. I’ve got the digital version and he is one of my all time favorites. Your card is beautiful. What a sweet card. That little donkey is adorable! The little donkey is so cute! He is colored perfectly, too. Great card! That donkey is just too cute! What a darling card! so cute! such a darling card, Beate! love love it! Wowwww, what a beautiful card with a nice stamp. Nice Spellbinders too. This image just makes you say AWWWwwww! So love your coloring choices, beautiful framing!